Straight off a coast-to-coast tour and into your living room, this Brian Regan DVD concert film captures the comic at his best. Butterflies, show horses, and greeting cards are no match when this master of standup grabs the microphone. His comedy—big enough for everyone, sharp enough for you—makes him one of the hottest acts in standup today. 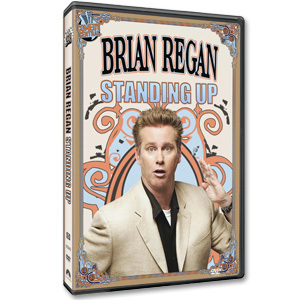 The DVD features the complete Brian Regan Comedy Central special along with an encore performance not shown in the original Comedy Central broadcast and Brian's Comedy Central Presents half hour special as a bonus. Region 1 encoded. These DVDs were shipped from the manufacturer without the table of contents insert card, which can be printed from this file here. One of the funniest Standup Specials I have ever seen, Would truly recommend. I can't write the review yet. I'm laughing too hard. And I'm only half way done with his performance. Awesome!! Gut busting funny as expected! !